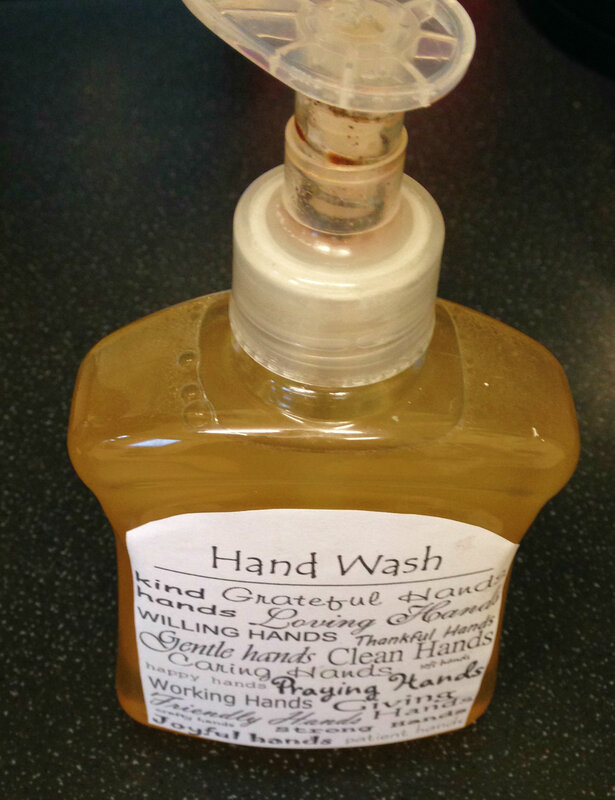 Instead of throwing away your handwash and spray bottles to go and buy new ones, why not recycle them and make your very own cheap, natural, Earth and animal friendly, delicious smelling products. I never tire of blending fragrant essential oils to make soap nut liquid smell good enough to eat, making cleaning a real pleasure and leaving your home smelling fresh and vibrant without that background, lingering chemical smell. What’s more, the liquid goes beyond cleaning your kitchen worktops but makes the perfect base for a soothing, naturally antibacterial and moisturising handwash. It can also be used as a body and hair wash and is gentle enough for babies and pets. All you need is a bag of soap nuts (I’ve had the same 1kg bag which cost under £10 since May last year! ), essential oils and optional extras of white vinegar and a moisturising liquid oil such as almond or avocado. For all you need to know about soap nuts including details on how to use them and other natural cleaning tips, see this post. Simply add a handful (about 10-15 half shells) to a pan and cover with a litre of hot tap water. Bring to a boil then simmer for ten minutes. Remove from the heat, cool, strain and you have basic soap nut liquid that can be used in so many ways and in so many places. Multiply as necessary to fill the volume of your bottles. Add 2 tablespoons of white vinegar to a spray bottle with a few drops each of grapefruit and orange essential oils then fill with the soap nut liquid, give a little shake and adjust the scent by adding more drops of essential oils if necessary. Take a handwash pump bottle (a foaming one works best) and add a tablespoon of avocado oil with a few drops of lime essential oil then fill with soap nut liquid. Shake and add more essential oil until you reach a scent that you like, you can also add an extra tablespoon of oil if your hands get really dry from washing. Use as you would any other hand wash. Printable handwash label personalised from here. This entry was posted in DIY, vegan, Vegetarian and tagged cleaning, DIY, eco friendly, green, healthy, homemade cleaning products, vegan, vegetarian. Bookmark the permalink. Amazing! I’ve been researching a few homemade cleaners and more green/natural options and this article has helped a lot. Thanks for sharing these cool tips, so innovative! This is so cool! I’m bookmarking this, I’ve got to try it out! Great, I hope you like this one! Looks great. I have not heard of soap nuts but will look I to this. Certainly cheaper than buying natural soaps, they are quite expensive. Plus vinegar cleanser doesn’t exactly smell very nice! I’ve done it! 🙂 Our handwash was nearly empty and I’ve had a bag of soap nuts sitting on the shelf for ages. What a great idea, thanks for the suggestion Poppy. That’s so exciting! I hope you love it, I love that it’s so much lighter than those thick gloopy things! Isn’t it so lovely when someone actually makes, cooks or tries out something you write about? I haven’t even picked up my copy of the magazine yet but have seen the pdf of the article. I’m really excited to join Vegetarian Living for a regular column! So thanks for the lovely feedback. Sure, I will leave them a comment on their website! I subscribe so get the magazine in the post each month along with Cook Vegetarian. Oh, that’s really sweet Poppy. Thank you! Did you enjoy the article about veganism in Germany in Cook Veg too? I went to visit my family last November with a friend and it was lovely coming back with so much exciting news! I just had to go back through to find that article – my apologies, it appears I was in a hurry and just flicked through the recipes in that issue! Gorgeous article also, I’d love to experience Germany some day, especially as I have heard such great things about veganism in Europe! This is great! Thank you for sharing 🙂 I love using soap nuts. I love this! And such great timing for me. I’ve recently just had the epiphany that if I’m eating so clean bc I’m concerned about keeping toxins out of my body, why do I slather chemicals on my skin and coat my house in them, too. This is brilliant and I am totally going to make these! It really does, and there’s nothing better than cleaning the kitchen with citrus, it’s so fresh! I hope you love it Sophia! I’ve never used soap nuts – do they work well as laundry detergent? I need to get some! Ok cool! I am going to get some – need to try them! These sound wonderfully natural and refreshing! Lovely ideas! The lotions sounds lovely! Is there another name for soap nuts? I haven’t heard of them, but really want to make the lotion. I’m in Minnesota, USA and after a month of -23C, I’m ready to make all sorts of lotions for family and myself. We’re all getting a little dried out here. Reblogged this on Lovely Vegan Ladies. Thank you so much Poppy! I love homemade cleaners but I’ve never used soap nuts before — even though I’ve made my own traditional soap. I’m off to find an Aussie supplier. How exciting. Thanks April. Soap nuts and essential oils mean we never need to use harmful chemicals again as it can be used for everything! Thanks Deena! I agree that they would make great gifts, especially the hand wash and the label can be personalised with names too! Let me finish all my old stocks first. I will try it all, can I share you tips? This is great Poppy! I use soapnuts for my laundry but haven’t branched out into using the foam for other cleaning. When I finish my spray bottle all-purpose cleaner I’m going to try your version. So timely, I have been thinking this weekend about making my own shower gel and am going to try your hand wash mix for that. Mine is very runny and I don’t get any lather from it either:( Any idea where I might have gone wrong? I boiled up the soap nuts, added some sweet almond oil and some orange essential oil. That’s really strange! It’s normal that it’s runny but it should definitely lather! Bear in mind though that it’s a gentle lather, nothing like chemical soaps. You should see the bubbles already when you pour water over the nuts in the pan? Maybe your soap nuts needs extra boiling to really get the saponin out of them? Or maybe try adding more of the nuts to the liquid. I do recommend a foaming dispenser for best results. I’ve never had this issue but I’ve only ever used the same brand of nuts so maybe other brands differ. Sorry you have had this problem. Also, don’t throw it out, just because it’s not lathering doesn’t mean it’s not cleaning!! Thanks so much, I didn’t see bubbles when I poured water over the nuts so maybe it’s the brand. It’s very helpful to know what to look out for! Thanks for liking my posts. Your blog is fabulous. This post is a very good idea and informative. wow – what a fabulous concoction! 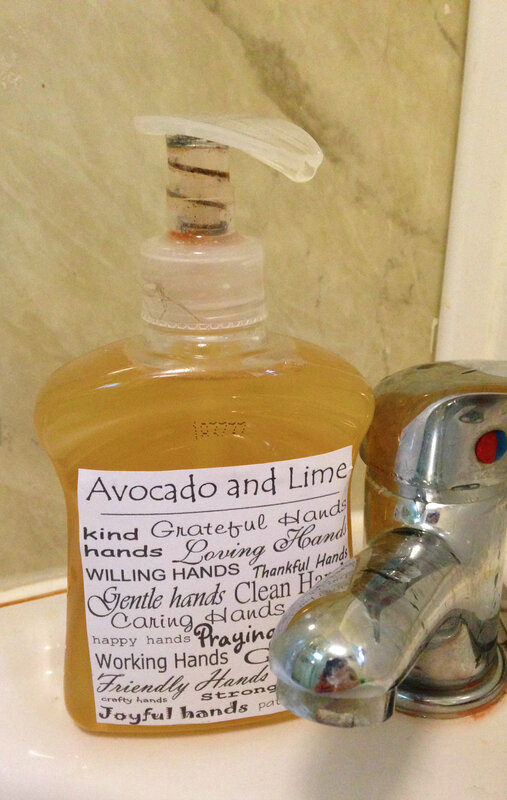 Okay, I had no idea one could make their own liquid soap! Fantastic! 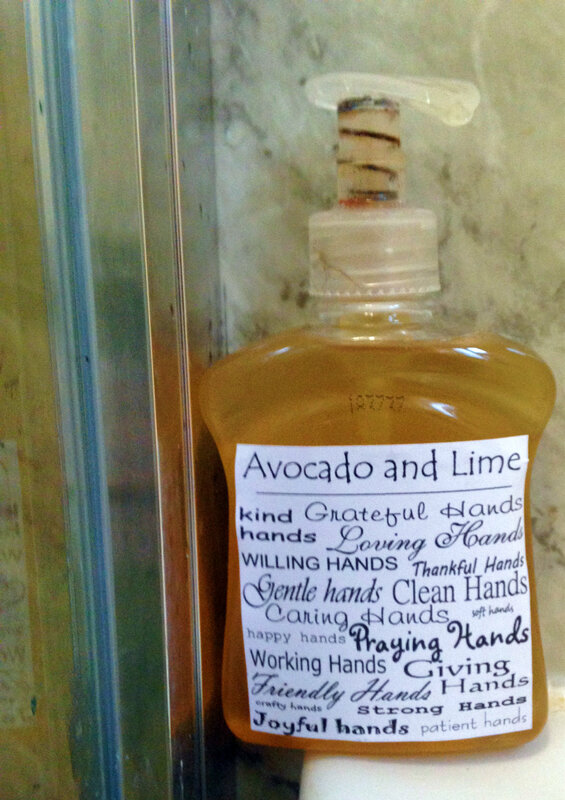 Love the hand soap label-and love the combination of oils.